Consider the problem of finding smaller "non-intersecting" circuits or paths in graphs embedded in the euclidean plane (visiting all vertices) in the sense of geometric intersections of edges plotted as lines. This is clearly closely related to TSP, travelling salesman problem for euclidean plane embedded graphs. Is it virtually the same problem or not? Is there research on and/or are there algorithms that enumerate small non-intersecting circuits/paths of planar graphs? In other words the $n$ graph vertices are already given as 2d coordinates of points. The problem is to find a $n$-vertex path or cycle through all the points such that when the edges are plotted as lines, the edges/lines do not cross. I did not find any literature directly on this in various online searches. A second somewhat related question: Is the shortest non intersecting path for a graph embedded in the euclidean plane on cs.se. This asks basically the same question for a path with $m$ points, $m \leq n$. The question is related to experiments & questions by a new cs.se user babibu. Let it be Euclidean graph: each vertex is a point on the 2D plane, so the weight of each edge is the Euclidean distance between the vertices. I tell you what I am going to prove that and then I try proving. So first I am going to show you that each planar graph with Hamiltonian circuit path, that have intersections, could be easily changed to shorter path, then I show you that those changes could be done in short time in compare to exponential time, and then I show you why I think that there are only very few options to find a non intersecting Hamiltonian circuit path and why I think that one of those options is the TSP optimal path. 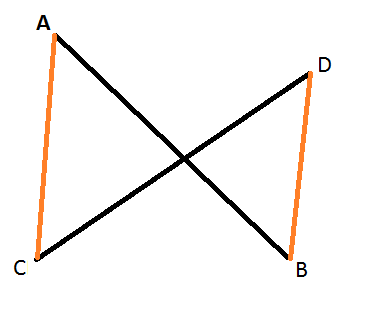 In this drawing you can see the edges $AB$ and $DC$ intersect with each other. In orange you can see the new edges, and now I am going to show you why those new edges are shorter. 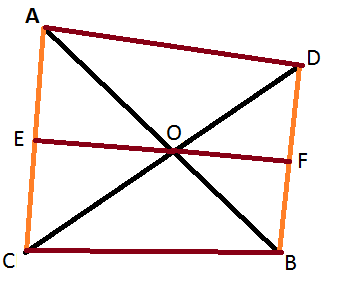 But before that I want to notice that this is a legal action in a graph, I do not break the rule that there would be no more than 2 edges connected to single vertex. And so we can say $AC + DB < AB + DC$. So by solving intersections in graph we can actually find a shorter paths and this is the reason there couldn't be any intersections in TSP optimal route. But even more interesting than that is calculating by just how much we cut the graph. I do not know how exactly explain this mathematically, I hope someone will be able to help me here, but try comparing $AB + DC$ to $AC + DB$ what is the difference between them. I think we need to look at the average difference between all the edges, and this difference cannot be very small in compare to $N$(This is the part that I do not know how to explain) so there could not be many "Fixes" like that, that we can do, so the efficiency of finding non intersecting graph is $O(CN^2)$ where $C$ is not a big number in compare to $N$. You can find here a pasado code that I wrote to implement this. Also I want to share with you the results of my guesses using this algorithm to guess what is the optimal toure. I used a sample data from this site, because I can't really know if my guess is the optimal toure or not. And so, it took me 122 millisecond to guess the optimal tour of 39 cities. 0 or 16 milliseconds for 29 cities and just a bit less than 3 sec guessing the optimal tour of 194 cities. Each of those numbers is the worst and also the average case of 50 tries on each input. Also I been trying to build a small test tool to get some feeling about how many non intersecting routes there are, and it looks like between $0.5N$ to $3N$. I can tell you that this subject is very interesting, I already spent weeks on that and continue the work. Not the answer you're looking for? Browse other questions tagged reference-request graph-algorithms optimization planar-graphs or ask your own question. Is optimal equal-point graph splitting NP-Complete? Maximum number of geometrically disjoint paths - is the complexity known?